“In the year that King Uzziah died I saw the Lord sitting upon a throne, high and lifted up; and the train of his robe filled the temple. Above him stood the seraphim.… And one called to another and said: ‘Holy, holy, holy is the Lord of hosts; the whole earth is full of his glory!’” (Isa. 6:1–3). Our last two days of study have focused on the grace of God shown in the flood account. We must not forget, however, that He judged the earth in the first place because of the wickedness of mankind (Gen. 6:5–7). Unfortunately, many churches today are reticent to discuss the gravity of sin, thus betraying a deficient view of our Creator’s holy majesty. To address this situation, we will devote some time studying this important attribute of God with the help of The Holiness of God, a teaching series by Dr. R.C. Sproul. Many of our American readers can probably remember the grief we experienced when President John F. Kennedy was assassinated in 1963. When the leader of any nation dies unexpectedly, it is a shock to that country’s citizens. Hundreds of years ago, the kingdom of Judah mourned the passing of its regent — King Uzziah. Yet the most significant event of that year was not the king’s death but the call of Isaiah, perhaps the foremost writing prophet. Today’s passage records the occasion on which he was ordained to his office. Granted a vision of the Lord Himself, Isaiah sees Him sitting on His throne, the train of His robe filling the temple (Isa. 6:1). A monarch’s garments have long been a measure of a ruler’s status. Even when kings and queens are elevated to the throne today, they often appear in robes so long that many people have to follow behind the monarch to carry the train. God’s majesty and weightiness is evident by His garment that fills the temple. The refulgent beauty of His holiness is also revealed by the seraphim who cannot bear to look at the Lord directly (v. 2). Moreover, the glory of the Almighty is so tremendous that even a hasty glance at His reflection is too much for sinners. Moses’ face shone so brightly after he saw only a brief glimpse of Jehovah’s “back” that Israel fearfully asked him to cover his face (Ex. 33:12–34:35). 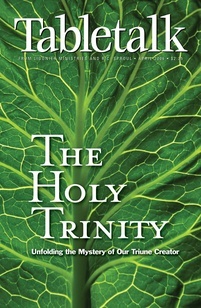 The holiness of God is thrice declared in Isaiah’s vision (Isa. 6:3). Hebrew authors use repetition to highlight a concept’s importance, and the seraphim’s “holy, holy, holy” shows that holiness is of God’s very essence and not an attribute we can take lightly. Among the many differences between the Bible and other religious texts is its view of the unsurpassable holiness of God. His purity is absolute and essential to His being in Scripture; it is something He will not compromise (Heb. 12:14). Such holiness is frightening to sinners and so this attribute is not often emphasized today. Spend some time meditating on today’s passage and the verses suggested for further study that you may always be aware of the Lord’s holiness.